Okay, sounds good. We'll get the TV started right away. 13, Houston. We'd like to disable quads C and D; use Alfa and Bravo. Over. — Disable quads C and D. Roger. Okay, 13. We've got Fred-o on TV. Roger, Houston. What we plan to do for you today is start out in the space shipper [sic] Odyssey, and take you on through from Odyssey in through the tunnel into Aquarius. And show you a little bit of the landing vehicle, and your TV operator is now resting on the center couch, looking at Fred Haise, whose head is now just about at the beginning of the tunnel, and his back is against the lower-equipment-bay optical area. And Fred will now transport himself into the tunnel, and into the spaceship Aquarius. You know one thing I noted, Jack, when I first came across here, that starting upright in the command module and heading down in Aquarius, there's a little bit of an orientation change that, even though I'd been through it once in the water tank, it still pretty unusual. I find myself, now, standing with my head on the floor when I get down inside the LM. That's a great picture, Jim. You got the light just right. And one of the nice things, Jack, particularly for a novice like myself, is the—the ease of moving around in here. It's, of course, as you know from working in the command module simulator, it's really quite a boon to have zero gravity as an aid. Because you get—pretty confining, really, at one g, to move around very much in there, and it's quite easy in this environment. The LM, as you can see, it looked pretty clean, I found a couple of loose washers about it and the—a little plastic cap off the sequence camera had come loose and I found it lodged over by the ED panel. Okay. Right under Jim, now, he's actually standing on a—what looks to be a can here. And, for the sake of all the people back there, housed inside this can is the—the LM ascent engine where, hopefully, you can see my hand resting on top of right now—the engine that we use to get off of the Moon. Immediately adjacent to the engine cover here, I have my hand on a white box now, which has been shown before. This happens to be Jim's PLSS, or the backpack which'll supply oxygen and water for cooling while on the lunar surface. This device we hope to make use of for—a planned 4 hours and possibly up to as much as 5 hours. Right—right behind the PLSS, a couple of little square packages I now have my hand on here, one here and one right below, are our OPSs, which are, in essence, the emergency oxygen supplies, which are good for some 40 to 45 minutes. These are when we get ready to mount up and head outside, will be placed up on top of the PLSS. The second backpack is mounted down on the LM floor, I hope, positioned right between the two of us. I have my hand on it at this time. Roger, Fred. We see it. The picture's coming through real good, and your description is good. We see Jim's got the camera oriented the way we like to look at it. So, keep talking. Okay. I guess everybody has pretty much envisioned the space program as being all a lot of exotic electronics, and, certainly, a lot of it is. But I thought I'd bring out a couple of items here in conjunction with the PLSS. After the first EVA, you get a very accurate measurement of the amount of water that's left in the PLSSs. We're going to make use of this bag I'm showing now to collect the remaining water out of the PLSS and see just how much we really did have left, and hopefully, on future missions, to be able to extend safely the allowable time on these units even a little further. And, my other hand, I have the mechanism by which we determine just how much water we really have in this bag. And I guess this—an apt description for this device would be a fish scale. And you can see I'm weighing myself right now, and it says I weigh actually less than zero right now. Guess its calibration isn't too good. I think even you'd weigh zero here, Jack. Houston, this is Jim. Since Fred's been in the lunar module, and since he's the lunar module pilot, this is the first time that he's felt that he's been right-side up. I might tell you that we're looking at right now, that round bag that's just behind Fred holds our vacuum hose; and when we get back inside the LM we'll hook the vacuum off our suits, and it's resting or it's attached to the hatch which will—we will open to go on to the lunar surface, and, of course, to come back in. The hatch which we have come to now is a round hatch, which is our docking hatch between the—between Odyssey and Aquarius. Roger, and we see Fred looking in the vacuum cleaner there now. Okay, what I have out now, Jack, is LEVVA, which has also been shown before. It's a head garment for wearing out on the surface, and I—I'm bringing Jim's out here to show a couple of MODs. One problem before is that the cast of characters down on the surface haven't been able to be distinguished apart very well. So, not only Jim's suit has some red stripes on it, but as you can see his LEVVA also has a—a red stripe. And now you can see one other MOD here too, Jack, which I hadn't really seen myself before. I guess on 12, Pete and A1 had commented about the—commented about having trouble with sunlight in the eyes, so on our LEVVAs they put on a new center section which you can pull down and use sort of like a baseball cap. Okay, Jack. Who fixed up our LEVVAs? How's the detail on this one, Jack? Can you see any detail in this picture now, or am I blocking out too much of the sunlight? That's affirmative. We've got a good picture of the LEVVA there, and it's coming through loud and clear. Okay, Jack, while Fred is putting away my helmet, you are looking over into Fred's station now. How's this picture, is it okay before—or do I have to adjust it? We have a hunch that the setting might be in PEAK but we recommend AVERAGE on the ALC if you haven't got it there already. Okay. And we're getting a good picture of the LMP side with the DEDA over there. Hey, Jack, one question on the command module here. Do I—I have the DAP right now wide deadband. Do you want me to begin setting up narrow deadband and nulling the rates to start PTC again? What I'm fishing out now, Jack, is another new piece of hardware that we are taking along this time as a result of some comments made on the Apollo 12 flight. What Fred is opening up—is a drink bag that we place inside of our neckring that will allow us to drink while we are on the lunar surface. They—Pete and Al—did not have that on Apollo 12 and they, consequently, got very thirsty. But we hope to alleviate that situation by having our own little bag of water which, with very little effort, we can have a sip or two while we are looking around and doing our geology work. So if you hear any funny noises, it is just probably the drink bag. Fred is now looking through our optical device. It's an instrument in which to aline our platform, and Fred is now looking into it just to see what kind of an outside picture he might be able to get. We might be able to use a TV camera to look through our optical instrument to the outside of the command module. 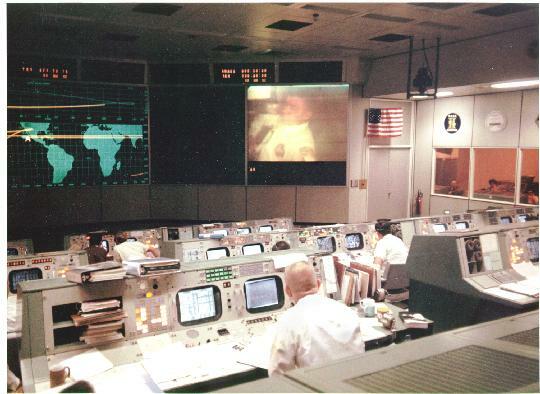 A few minutes ago while we first came in, we did manage to look to the outside of the side hatch of the command module through our optical instrument. Stand by. We'll try to see what we can do here. Roger, Jim. Break, Jack, we'd like you to stay in the deadband you are now in, and we'll make a change when the TV is over. Another thing we would like you to do is check your pitch and yaw on your high gain meter so we can compare it with what we're seeing down here. Okay, it's showing about—say 28 degrees and 267. Okay, Jack, have you got that picture now? Fred, about one-quarter of our screen is lighted and it's impossible to determine what you are looking at right now. Maybe you could give us a little verbal description. Okay. It's looking through the AOT in position 4, right rear. And we're looking back toward the—over the side hatch at the aft side of the service module. Okay. Is—is it too dark a picture, Jack? You think the f-stop open may help? No, Fred, it's got to be centered up a little bit. That's primarily what you have to do. Jack, we can't center it up any more, because the side hatch is only one part of the AOT. The rest of that blackness you see is really space. Okay. We'll try another one, and it's a little better centered. In fact, the only other one we have that shows the whole picture. We're in the forward detent of the AOT now, position 2, and you should be seeing something familiar like a radar antenna. Okay, we see you moving the camera up to the AOT lens, and we got a real good picture now.